(CNN) -- Nigerian militants threatened to end their cease-fire not long after it began Wednesday because they claimed the government was threatening one of their camps. Before the cease-fire, MEND destroyed oil pipelines in Lagos during a night raid on Monday. The militant group MEND said seven military joint task force gun boats with heavily armed troops were headed toward a camp near the border of the coastal states of Delta and Ondo. "If this information from a very reliable source within the JTF happens to be true, the cease-fire will be called off with immediate effect," the group's spokesman, Jomo Gbomo, said in a statement. "We are monitoring the armada and sincerely hope that the planned attack will be converted to a war exercise." MEND declared a 60-day truce earlier in the day following this week's release of its leader as part of an amnesty deal with the government. The response from Nigeria's military was positive, but muted. "It's a welcome development, but we are continuing to do our normal assignment of maintaining law and order," said Col. Rabe Abubakar, a spokesman for Nigeria's military. MEND leader Henry Okah, who had been the group's main arms smuggler, was arrested in September 2007 in the Angolan capital, Luanda. He was later extradited to Nigeria and was in prison until Monday. The cease-fire put on hold MEND's "all-out war" on the government. The group is demanding a fairer distribution of oil wealth in the Niger Delta. It wants oil revenue reinvested in the region, instead of enriching those whom the militants consider corrupt politicians. 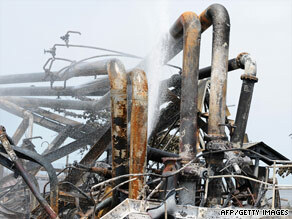 Many of MEND's attacks have been aimed at oil and gas installations in the region. Okah's release had been a key demand of MEND before it would accept any government amnesty offer. MEND's statement said the group will put together a team of "wise men and women" to "convey our demands to government." "A compulsory prelude to talks is the withdrawal of the military joint task forces from the Gbaramatu communities and the return of all the displaced persons back to their various homes," Gbomo said. "Hopefully, the cease-fire period will create an enabling environment for progressive dialogue." The militants have claimed attacks in recent years on oil platforms, chemical tankers, and oil pipelines. They have also kidnapped oil company workers. The repeated attacks have disrupted oil companies' operations in Nigeria, severely disrupting production and causing prices to climb. Covering 46,500 square miles (75,000 square km), the oil-producing region of the Niger Delta is about the same size as the Czech Republic or the U.S. state of Pennsylvania, according to the United Nations Development Program (UNDP). An area of rich biological diversity, the region contains the world's third-largest wetland with the most extensive freshwater swamp forest, according to the UNDP. More than half the area contains creeks and small islands, while the rest is rainforest, the UNDP says. At the same time, the Niger Delta produces the oil wealth that accounts for the bulk of Nigeria's foreign earnings, the UNDP says.